This article was originally posted on https://www.bigrentz.com/how-to-guides/guide-home-modifications-prevent-seniors-falling and reposted with permission. If you have a senior loved one under your roof or living independently nearby, you probably find yourself wondering what you can do to keep them safer. Of all of the risks seniors face, falling is one of the worst. According to the Center for Disease Control, one out of every five falls causes a serious injury, including broken bones or head injuries. The CDC also states that falls are the top cause of fatal and non-fatal injuries in Americans aged 65 and older. Even when falls are not fatal, they greatly impact the senior’s quality of life, and the resulting injuries often mean that the senior is no longer able to live independently. So how at-risk is your senior loved one for a fall? Consider this fact: each year, 29 million seniors suffer falls and around 27,000 die from fall-related injuries. Every single fall puts the senior’s life at risk. In one study, only 22% of those who survived a fall were able to live on their own afterward. The trauma and pain caused by falling, combined with a fear of a repeat fall, can render a senior incapable of living independently. In light of these statistics, it’s clear that preventing falls is the best way to approach this problem. Once a fall occurs, recovering from it is incredibly difficult. Yet that does not mean that seniors cannot live independently or age in place safely. The key to preventing falls and ensuring a high quality of life for your senior loved one is making the home a safe place where falls are not likely. There are many small, medium, and large home modifications you can make that will eliminate as much fall risk as possible, allowing your senior loved one to age in place comfortably and safely. 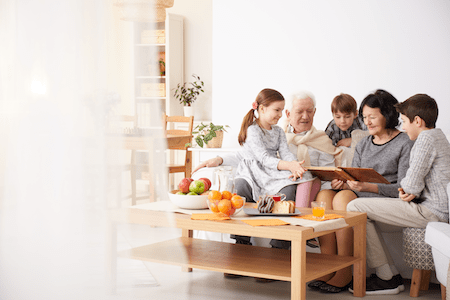 This guide is intended to help you evaluate the living environment for the seniors in your life, so you can create a space that is free from unnecessary fall risks. With the tips you will find here, you can protect your loved ones from falling, so they can age in place as safely as possible for as long as possible. Is your loved one at risk for a fall? If they are over the age of 65, then the answer is yes. However, there may be more to that risk than age alone. According to the National Institutes of Health, falls account for 45% of the injuries in a home that require medical attention. For those ages 65 and older, 60% of the falls that sent people to the ER occurred in the home. There are many reasons for this. Lowered visual acuity, diminished hearing, decreased mobility, and even decreased ability to feel in the limbs are all potential reasons that seniors have an increased fall risk. Sometimes, the risk is less because of the senior’s current health and more because of the home environment or even behavioral factors that make the person more prone to falling. Before you can tackle the home modifications that will help prevent falls, you need to understand the risk factors that put seniors at risk for falling. Know which medical conditions can increase fall risk. If your senior loved one has a medical condition, talk to his or her doctor about how that impacts fall risk. Nephropathy, arthritis, and cardiovascular conditions are all risk factors. Know how the general effects of aging increase fall risk. As people age, their muscles become weaker and their balance systems do not work as they once did. They may lose feeling in their feet and become easily disoriented. Check medications for side effects related to falling. Medications that cause tiredness or dizziness can increase fall risk. Know how vision or hearing loss can increase falling risk. When people cannot see well, they may not see hazards in their way while walking through the home. When people cannot hear, they will not know when someone warns them about a risk. Hearing problems can also impact an individual’s balance because the ears are closely tied to the body’s balance system. Realize that memory loss adds to the problem. As seniors become more forgetful, they may wander into an area that has a fall risk without thinking. Memory conditions like dementia may also cause difficulties with processing and reacting to situations. Understand that falls are a higher risk when seniors refuse to accept their limitations. Many seniors do not want to ask for help, use a walker, or slow down, even when they need to. This can make them more prone to falling. Realize that inactivity weakens muscles and increases fall risk. Some seniors slow down too much, and inactivity makes falls more likely because the body is weakened. Take a look around your home with a new goal in mind. Do you see any tripping hazards or safety issues that could lead to a fall? Half of all accidental deaths that occur at home are caused by a fall, and most are at ground level. Every room in the home is at risk, but some are riskier than others. The bathroom and kitchen, for example, account for the most falls at home. 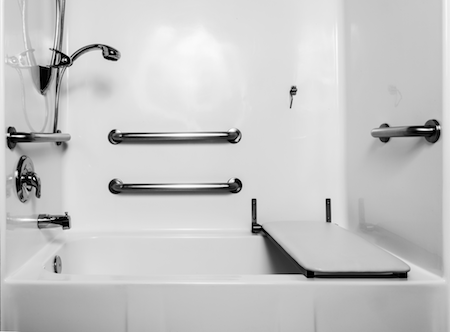 In fact, each year over 235,000 people visit the emergency room because of falls in the bathroom. If you have a senior loved one, you want to do what you can to make the home safer to prevent falls and the devastation they bring. There are many interior and exterior home modifications you can tackle to reduce the risk of falls for seniors. While the cost varies, and some can be pricey, the cost of injuries from falls is much worse. From simple things like adding night lights to massive projects that change the footprint of the home, there are a variety of modifications to consider. Here is a survey of some small, medium, and large changes that can make your environment safer for the seniors in your life. Many safety measures are inexpensive and take almost no time. From plugging in a nightlight to reorganizing kitchen cupboards, these are comparatively small changes that can have a big impact in terms of safety. The price may vary, but these are things most people can do in less than a day without professional help. Install nightlights to prevent falls during the night. Illuminate the path to areas your senior may need to walk, like the bathroom or kitchen, after bedtime. Remember that these lights may need to be brighter than the ones you would install for children, as seniors have more vision concerns. Used timed lights. Seniors may forget to turn on nightlights or outdoor lights. Use timed lighting systems to ensure adequate lighting at all times. Use remote control lighting to make it easier for seniors to control lighting. A fall could happen while a senior is trying to get to the light switch after dark. Remote control lighting can prevent this. Many simple off-the-shelf options are available at retailers like Walmart, Target, or Home Depot. Invest in touch-operated lamps. Turning on lamps that are not accessed by a switch is difficult for fingers with arthritis and other concerns, so consider touch operated lamp. Clean spills immediately. While not a home modification, make sure that everyone involved in the senior’s care knows to clean spills immediately. Water on the bathroom or kitchen floor will create a slipping hazard. Remove area rugs. Area rugs can slip or cause a tripping hazard. They can also create problems with uneven flooring surfaces. Remove them when possible, or replace with rubber backed rugs in areas where they are needed, like the kitchen or bathroom. Store most-used items within easy reach. 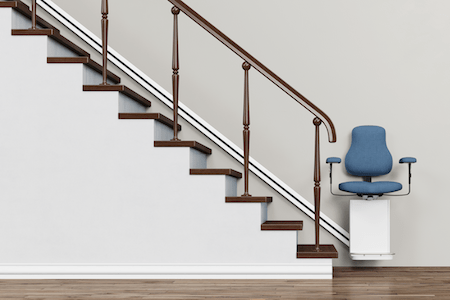 A senior climbing on a step stool or chair to retrieve an item stored too high is dangerous. Store the most used items in lower cupboards to prevent a fall. Place no-slip pads in the tub. A wet tub or shower floor is incredibly slippery. No-slip pads or other traction additions are essential. Invest in a shower chair. A shower chair gives the individual the freedom to sit comfortably while showering. Invest in one and use a hand-held shower faucet to provide bathing safety and independence. Purchase a toilet surround. This simple tool provides excellent stability for toileting, especially if the bathroom’s layout does not allow for grab bars on both sides of the toilet. Install a bedroom phone. Having close access to a phone in case of an emergency is an important safety measure, so consider installing a bedroom phone. Many cordless phones don’t require a jack as long as the base is somewhere in the house. Lower closet rods. Place closet rods at a lower height to allow them to be accessible. Add rails to the bed. Seniors can sometimes fall out of bed, and rails on the bed also help them climb in and out more easily. Install a lock. Because seniors should not be using basements, consider installing a lock and having basement tasks performed by caregivers. The lock will prevent the senior from trying to access the area unsafely. Properly light the basement and the basement stairwell. Falls can easily occur when the area is too dark. Make sure the area is well lit and that the lighting is easily controlled without reaching for a high pull switch. Avoid having the senior use attic spaces if possible. The attic is not a safe place for a senior, so it’s best avoided. Provide adequate shade. Seniors who become overly hot while spending time outside can fall due to heat exhaustion. Make sure the deck has shaded spots. A deck table with umbrella is a cost-effective way to do this. Inspect the yard for exposed roots and holes. Cover exposed roots with mulch and fill holes with dirt to prevent a fall. Add traction to the edge of steps. Non-slip strips are helpful here. Improve visibility of steps. Painting the edge or adding a reflective strip will ensure elderly loved ones do not miss a step. Sometimes, non-slip strips in bright colors can handle this task as well. Some projects require a professional, but aren’t hugely expensive or time-consuming. An electrician can move outlets and add switches in a matter of hours. If you have a list of items, it might be worth booking a handyman for half a day to install grab bars, fix flooring, and hang blinds. Install blinds and curtains to reduce daytime glare. Seniors have trouble adapting to changing light, and glare from the sun is difficult to manage, so keep it to a minimum. Change the light switches to a lighted rocker-panel style. These are easier for seniors to find and flip. This will ensure that the senior is able to turn on lights easily to prevent a fall. Move light switches closer to the couch or bed. If a senior is seated on the couch or laying in bed, having the light switch nearby could help prevent an accident. Add motion sensing light to main pathways. If you don’t want nightlights to remain on at all times, install motion sensors to the lights on main pathways that will switch on when someone enters the area. Upgrade lighting near stairs. Stairs are notoriously poorly lit, yet are one of the most dangerous areas for seniors. Make sure there is ample lighting in these areas. Install task lighting near important areas. Task lighting is installed under cabinets, near beds and in other areas where additional lighting may be needed for safety. This adds a bit more lighting to ensure these critical areas are properly illuminated. Lower light switches and thermostat controls. Make sure all important controls in the home are able to be reached from a seated position. Make thresholds even. The little lip or ledge on a threshold is a serious tripping hazard. Remove steps and bumps to make the threshold between the house and the outside or between rooms even. If this is not possible, make it more ramp-like and less step-like. Fix uneven flooring. Hard flooring options can sometimes settle and become uneven. Even the slightest difference can create a tripping hazard, so fix these problems. Install ramps where needed. When stairs cannot be avoided, install ramps to make the area more accessible and provide less of a tripping hazard. Make sure the floor surface is non-glare. Shiny tile or linoleum can cause a glare that would contribute to a fall. Make sure you do not polish or wax floors in homes with seniors. 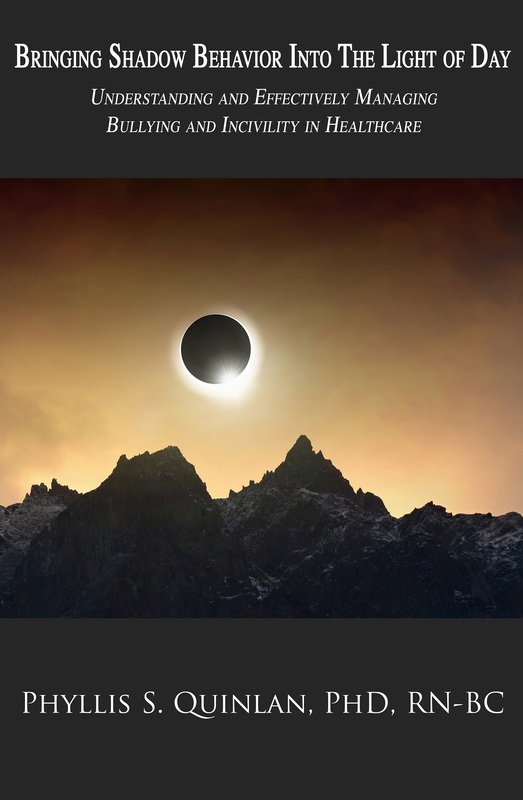 A matte coating can reduce glare. Consider installing soft-closing cabinets and drawers. A senior who has to use too much effort to open or close cabinets or drawers could lose balance and fall. These cabinet upgrades are also easier for arthritic hands to manage. Install pull-out shelving in cabinets. Seniors may have trouble bending and reaching into a cabinet. Pull-out shelving or shelving drawers makes it possible to see everything in the cabinet. Make sure the stairway has a rail on both sides. 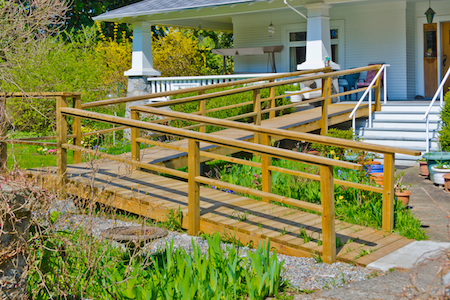 Many homes have just one rail for the stairs, but seniors need the stability that comes from two. The handrail should be at elbow height and be anchored well to the wall. Add something to increase tread on hard stairs. Stairs made from hardwoods or laminates may need tread or non-slip stickers to avoid slipping hazards. Use no-slip tape, and consider an option that adds contrast to improve the visibility of the stairs at the same time. Install grab bars near the toilet and shower or tub. These provide a secure handhold for getting in and out of the tub or raising up and down off of the toilet. It’s best to have them professionally installed for maximum safety. Choose a raised toilet. The less a senior has to lower to use the toilet, the easier the task will be and the less risk the senior has for falling. Lower the vanity or mirror. If your senior is in a wheelchair, lower the vanity and mirror to make it accessible. This will prevent the senior from trying to stand to perform basic toiletry tasks. Install handholds to help with getting in and out of beds. Trapeze bars or a wall bar can make this important task easier for seniors. Swap out the bed. Change the bed for one that is at a better height for your senior’s needs, or invest in an adjustable bed. Swap out folding closet doors for pocket doors. On closets, if you have the space opt for pocket doors which allow a wider entry. Add a rail if needed. Make sure the basement stairs have rails on both sides. Check the deck surface for uneven boards. As deck boards age, they can warp, which leaves an uneven surface to the deck. Check the deck for any problems, and consider replacing boards that are no longer flat and even. Add railing to deck stairs and edges. If you have any edges without rails or stairs without adequate rails, install them. However, for stairways, make sure the rails are the right size for easy grasping. Some deck designs have wide rails that seniors cannot easily grasp. Invest in adequate lighting. That bare bulb in the middle of the garage isn’t going to be sufficient to keep a senior from falling. Add more lighting and make sure key areas, like the entry to the home, are properly lit. Add traction to slippery surfaces. Cement can be slick when wet. If there isn’t enough texture on your garage floor, consider adding non-slip strips to add traction. You definitely want to add these to the entry steps if you are not adding a ramp. Place storage at a comfortable height. A garage is an excellent place to store many items, but make sure they are stored where a senior can reach without using a stool or ladder. If you cannot lower the storage, consider a lift-based storage system that can lower when needed. Level any extremely uneven ground. Non-paved surfaces may not be able to be completely level, but try to level those areas that are extremely uneven. Use fill dirt or rent compaction equipment to level any ground is presenting a fall risk. Create a paved walking path. Loose stones or dirt paths can be hazardous, so consider installing a paved walking path for safety. Add rails if needed. Route water away. Pooling water can cause people to slip, and in the winter it is a serious risk when it freezes. Use slope and drainage to prevent pooling water. 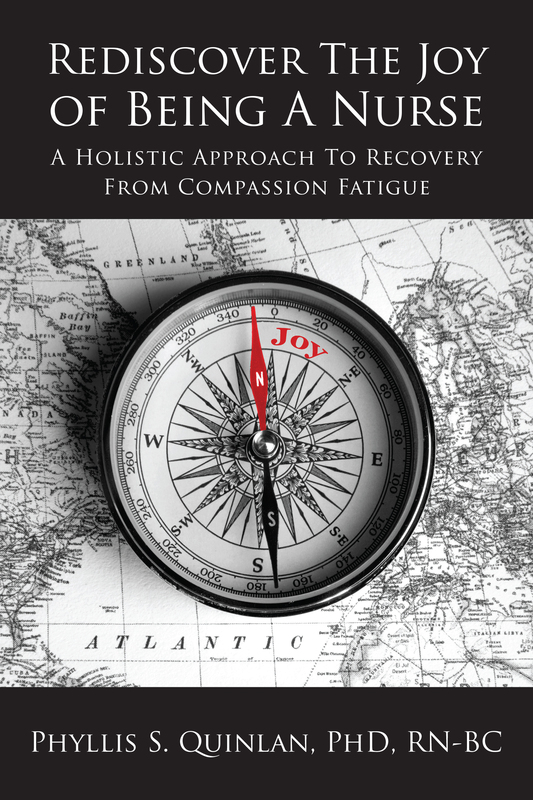 Trenchers can create channels to redirect the flow. Change the texture. If the walkways often become slick, change their texture to add more traction. Textured paint can work well for this. Inspect for unevenness. Cracks, bubbles, and lumps are all a serious risk for the elderly, so make sure sidewalks, driveways, and other walkway surfaces are nice and even. Add rails for safety. Sturdy rails that are properly bolted into the ground or anchored to the concrete are important for safety. Add these to all stairways. Some home modifications require contractors and building permits – especially if you’re looking to make structural changes to your home. Other projects don’t require that level of expertise, but will cause some disruption. Ripping up flooring and replacing cabinets is noisy, dusty, and makes parts of the home uninhabitable during the project. Large projects require a commitment of time, money, and patience, but they yield the most dramatic results. Replace your floors. If your floors are slippery or in poor condition, consider replacing them. Laminate flooring and tile can be quite slippery on stocking feet or when wet. Older floors can have cracks and bumps. Installing new floors that are slip-resistant can prevent falls. Raise sunken living rooms. A sunken living room is a danger every time it is accessed by a senior. Consider hiring a contractor to raise it and eliminate this risk. Lower appliances and counters for accessibility. If a senior is in a wheelchair, make sure the room is accessible by lowering the counters and appliances. Make sure the most commonly used small appliances are on the counter top level within easy reach. Invest in an accessible shower or tub. Climbing in and out of a traditional shower or tub is dangerous for many seniors. Replace your tub with a walk-in version. Create more floor space in the bathroom. Wheelchairs need a five-foot turning radius in the bathroom. While expanding the bathroom to accommodate this can be a costly renovation, tackling it will give your senior enough space to take care of bathroom needs independently. Sometimes, simply removing some of the bathroom’s features is sufficient, but you may have to tackle a more costly remodel for this task. Build a walk-in closet. Adding some additional walk-in storage space will keep clutter off the floor and make it easier for your loved one to find clothing items as needed. Invest in a stair lift. 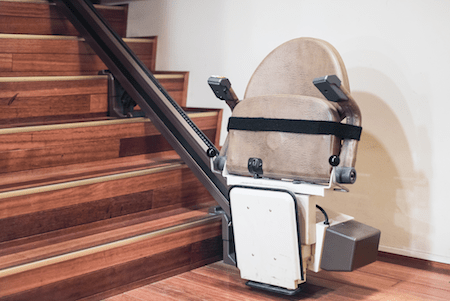 If it’s not possible to avoid stairs, invest in a stair lift to keep your senior from having to climb them. Consider moving the senior to a first-floor bedroom. If you have extra space this is a simple fix, but if you need to, consider a remodel that adds a bedroom to the main floor. Determine if a small elevator would fit in your home. If the home is large enough to accommodate one, a small, single-person elevator can help. Remodel the home to make it work for multi-generation living. It’s possible to have more than one generation living in the same home without feeling cramped. Consider talking to a contractor about these options. Widen the stairs if needed. Basement stairs are typically quite narrow, and this can be challenging for older feet to navigate. Consider replacing the stairs with less steep options. This requires the help of a contractor, but if the stairs are steep, consider removing them and replacing them with a model that is not as steep. Replace ladder access with stairs. Stairs are always safer than a ladder. If you want to use your attic and it has a pull-down ladder access, have a contractor install stairs instead and make sure they have adequate handrails. Consider a spiral stair design. If you have the room, use a spiral stair design to make the attic safer to access. Inspect the roof line to see if modifications need to be made. Older adults can fall if they hit their head on a low-hanging beam. It is possible to modify the roof line if attic access cannot be avoided, but only with the help of a qualified contractor. Consider replacing the deck with a non-wood option. While this is the most costly option, replacing a wood deck with a faux wood composite or PVC material will prevent warping and the hazards that come with wood. Make the entry and exit to the home clear and safe. The garage entrance to your home might have steep stairs that lack handrails and a high threshold. Make this safer by installing a ramp, handrail, wider stairs, or whatever other modifications are necessary to make access safe. Consider widening the garage. If the garage is a tight fit for your vehicles, consider widening it to provide additional space to maneuver walkers or wheelchairs. Use raised beds in garden areas. 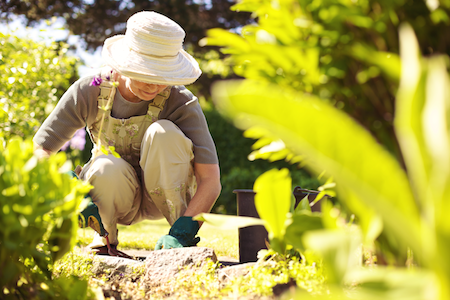 If your senior loves to garden, consider a raised bed so that they can do so safely without bending which puts them at risk for falling. You can hire a contractor or rent an excavator and do it yourself. Eliminate steps when possible. Removing steps and adding ramps is always the safest option. Make steps wider and shorter. Steps that cannot be removed can be made safer by making them wider and shorter. Widen doorways and entries for wheelchair access. Once inside the home, a wheelchair user may find that the doorways are not wide enough for wheelchair use. The ADA recommends doorways be between 32 and 48 inches wide to accommodate wheelchairs. The door also needs to open a full 90 degrees. Some simple ways to do this include reversing the door’s swing, installing swing-away hinges, and removing some of the woodwork around the door. 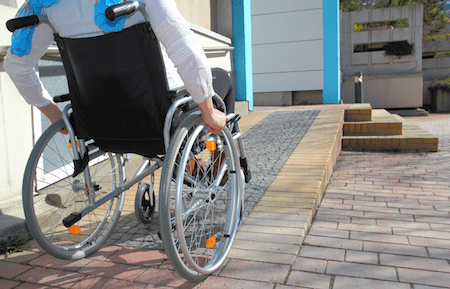 While some of the tasks you will need to tackle to make your home accessible are perfect DIY projects, others, especially modifications for wheelchairs, will require the help of a contractor. Finding the right one is not always easy. You will not only need one that is responsible and skilled as a contractor, but you are going to need one who understands the unique needs of seniors and the mobility challenged. While you need to check references, visit the Better Business Bureau website, and see examples of past projects any time you hire a contractor, there are some more specific considerations to make in this instance. 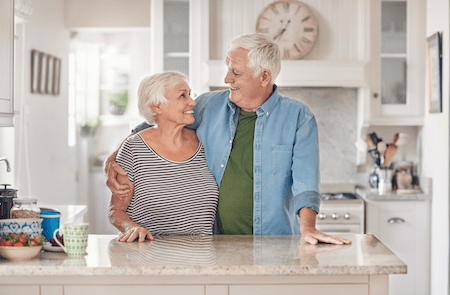 Here are some tips and tricks to help you find a contractor who will do a great job with your home modifications to ensure your senior is safe and protected. Start by looking for contractors with experience specific to senior living. When interviewing contractors, ask about their experience specific to senior living home modifications. Look for Certified Aging-in-Place Specialist designation. The National Association of Home Builders offers this designation to contractors who have shown expertise in home modifications for seniors. If you can find a contractor with this designation, you’ve found one who knows how to handle the task at hand. Ask about local building codes designed to prevent falls. Things like lighting in stairways and handrails may be covered in your local building codes. Ask the contractor you’re considering about these codes and make sure he or she is knowledgeable about them. 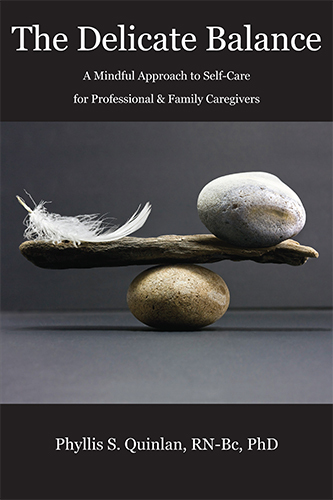 Before finalizing your plans, have the contractor talk with an occupational therapist. Occupational therapists can sometimes find problems with the plans that you would not have thought of. Have one to consult before you sign with a contractor and start the renovation. Know the important considerations for historic homes. If your loved one lives in a historic home, you might have some specific considerations to make before you can make home modifications. Check with the local city government to see if there are any protections in place for the home. Check the National Register of Historic Places to ensure it is not listed. If it is, you may have limited options for renovation. The basic structure of these homes is protected. Choose a contractor with historic home experience, if needed. Older homes may have additional problems, like outdated wiring or plumbing, that have to be addressed in an older home. Work with a contractor who is experienced with these renovations. com: How Can I Find a Qualified Builder to Remodel a Home for Elderly Parents? 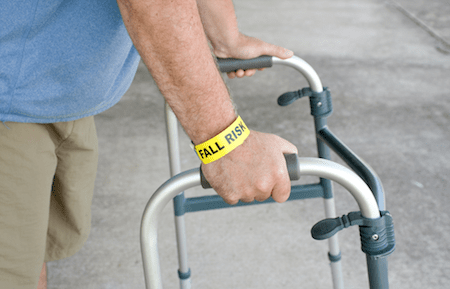 Falls are serious for anyone, but for a senior they are even more dangerous because of the potential ramifications of a fall. Thankfully, you do have options to help prevent falls at home and keep your senior loved one safe. By taking the time to make these modifications, you will create a safe home environment for the senior in your life. You want your senior loved one to live safely at home, whether independently at home or with you. You want that home to be a place where they can get around easily, without fear of injury because of falling. Yes, it takes time and effort to get a home in the right condition to be safe for seniors, but it is time and energy worth spending. Your senior loved one will be happier at home enjoying independence, and a happier senior will live a longer, more fulfilling life. When you know that your senior is safe from unnecessary fall risks, you can be more confident in leaving them at home.